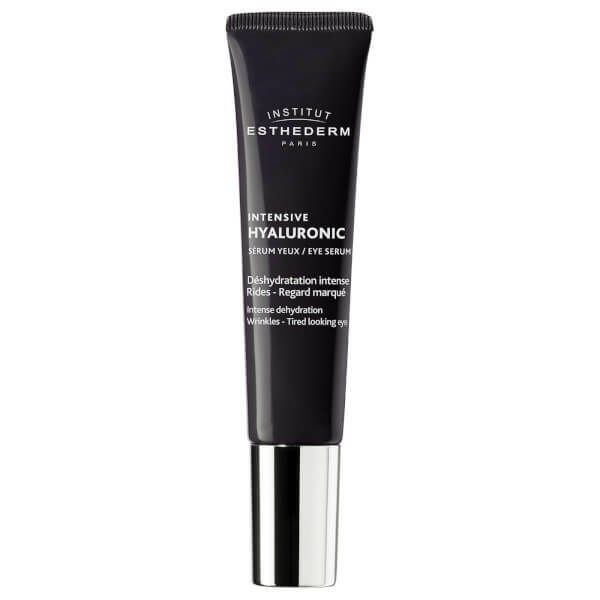 Revive the look of tired eyes with the Institut Esthederm Intensive Hyaluronic Eye Contour, a highly concentrated eye serum formulated to address signs of ageing and fatigue around the delicate eye area. With a hydra-plumping texture, the eye treatment intensely moisturises and refreshes the look of skin, smoothing the appearance of fine lines and wrinkles while illuminating dark shadows. Tired, weary eyes appear well-rested and rejuvenated. Using the applicator, apply small beads under, outer corner and one on the arch of the eyebrows. Smooth with the applicator from the inside outward. Move in small circles from the inside outwards. Aqua/Water/Eau*, Glycerin, Butylene Glycol, Ethylhexyl Palmitate, Hydroxyethyl, Acrylate/Sodium Acryloyldimethyl Taurate Copolymer, Sodium Polyacrylate, Sodium Hyaluronate, Squaliane, Pentylene Glycol, Caprylyl Glycol, Carnosine, 1, 2-Hexanediol, Caffeine, Sodium Citrate, Glyceryl Acrylate/Acrylic Acid Copolymer, Polysorbate 60, Phenoxyethanol, Silica Dimethyl Silylate, Propylene Glycol, Adenosine, Neoruscogenin, Sorbitan Isostearate, Ruscogenin, Disodium Adenosine Triphosphate, Hexylene Glycol, Laminara Digitata Extract, [Es561]* Cellular Water (Aqua/Disodium Adenosine Triphosphate/Carnosine/Mineral Salts).